Salads can be very filling and healthy, not mention inexpensive. So I try to create a lot of them. I just loved the Spinach and Wild Rice Salad recipe that we came up with a few weeks ago. That recipe inspired me to create this one. 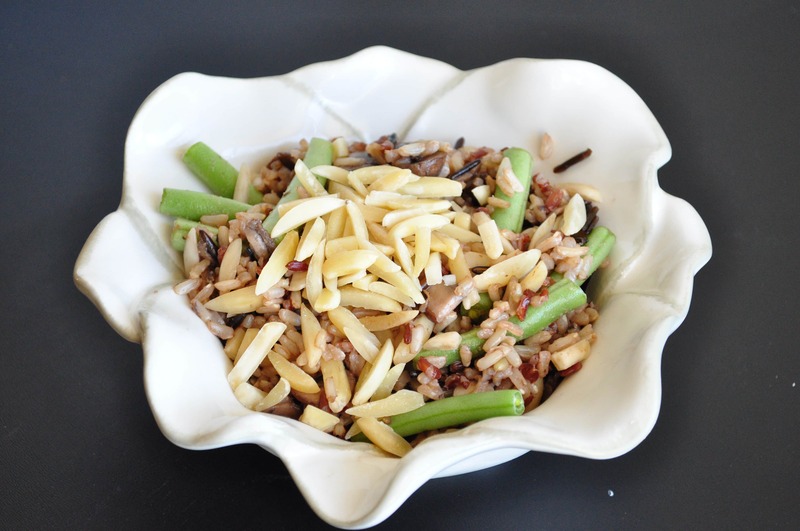 Wild rice has a nice earthy flavor that I just thought would go really well with the mushrooms and the almonds. If you eat tempeh, you can even throw that in this as well for an extra amount of protein. I had to stop my husband from eating it all so I could snap some photos! As the rice is cooking, cook the mushrooms in the oil slightly in a pan. Just enough to soften them. Set them aside. Once the rice is done, combine all the ingredients together in a large bowl. We actually cooked the rice ahead of time and let it cool in the fridge, but I think this dish would be great hot or cold. So do whichever you prefer. That’s it. This makes about 3-4 servings. Did you cook the green beans a little? I didn't, but you can if you want to. This looks like it has another rice besides the wild rice, but I only see wild rice in the ingredients...Sounds yummy! I only used wild rice in this.